We have recently received a couple of great after-charter comments from clients we had aboard the motoryacht Carabella that we'd like to share with you. 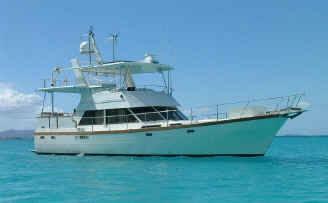 CARABELLA is a 48-foot motor yacht with the American crew of Jerry and Shary Monson, along with their cat, Pippi. Carabella is air conditioned and accommodates 2 guests in their aft stateroom which has a Queen-sized, walkaround berth and ensuite head/shower. 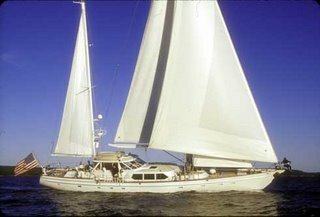 For family charters, 2 kids can take the forward cabin (twin berths), and the crew will sleep in the curtained-off dinette. Carabella has a 9.5-foot dinghy with 15HP motor, windglider, snorkel equipment, fishing gear, floating mats, etc. Plus, they have Satellite TV in the salon and guest cabin so you won't miss your favorite shows or sports events while on vacation. Awesome vacation! One, if not “The Best” we have ever taken. From the moment Tricia and I boarded the Carabella and were greeted by Jerry and Shary, we knew that we had made the right decision and were clearly on our way to the beginning of a dream vacation. 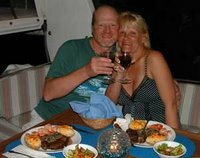 They spoiled and pampered us everyday as they led us to the most beautiful sites throughout the US and British Virgin islands. During the day, our adventures took us to uninhabited beaches only reachable by boat and numerous coves, caves, snorkeling spots and coral reefs, which were filled with all types of colorful sea creatures, so many, we are still working to identify all the ones that we saw and had crossed our paths. The daily excursions were thoroughly planned out with us in mind, knowing what our preferences were and understanding the type of vacation that we had sought out. They always kept the weather in mind, trying to bypass any rough seas out of respect for their guests. Their extensive knowledge of the environment, the area, along with excellent navigation skills, they were able to guide us into some very protected anchorages for calm nights. Their enthusiasm and experience as a Charter couple was very welcomed as we observed them and the skills they portrayed daily. During the evenings, they provided expert guidance and recommendations for some of the hottest night spots, so we could enjoy some of the local beach bars, island beverages (Pain Killers) and experience some of the local traditions along with dancing and fun. Best of all, no worries for us, when we we’re ready to come back aboard, a simple call using the Marine radio is all we had to do and Jerry was on his way to pick us up. I could go on and on as to the many wonderful experiences we had aboard the Carabella, but will end this reference letter with just a few more comments. The food was excellent and very plentiful. Shary spent a considerable amount of time and took great pride in planning something delicious, well balanced and different for each meal. The Beer was always cold, mixed drinks readily available upon request or simply there for us to make ourselves. One of the most important things of all, the company of Jerry and Shary was thoroughly enjoyable throughout the trip. We would recommend the Carabella and the Crew to anyone looking for an awesome vacation or a dream vacation as we were searching for.. Only a few days back to the ole grind, we are all ready looking forward to a return trip. Thanks for everything! We had one of the best vacations ever! Jerry and Shary were the perfect Captain and Admiral anyone could wish for. Kick back and get down at one of the biggest jump-ups in the Caribbean, the third annual Jazz Fest in Tobago! Attend this exciting event aboard your privately charter yacht. BLUE MOON is a 56-foot (LOD) ketch that accommodates four guest in two double cabins. 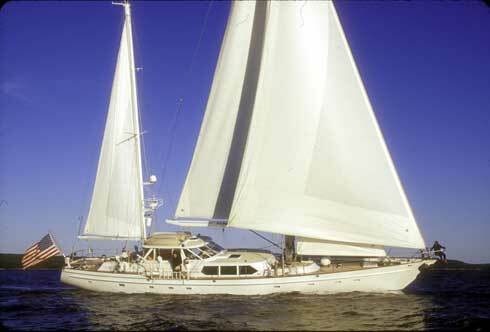 RATES: $7,000/wk for 2 guests & $8,000/wk for 4 guests, excluding bar/beverages, dockage, taxes. The 3rd Annual Plymouth Jazz Festival 2007 will be held April 27-29, 2007. Live your dream of sailing across the ocean! 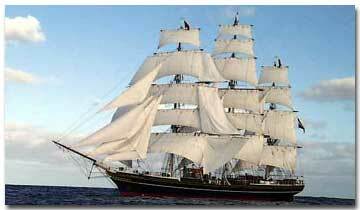 Depart Ft. Lauderdale, March 28, 2007 - Arrive April 27 in Lisbon with stops in Bermuda and the Azores (Horta). If you think making a transatlantic crossing means a 45' boat and hot-bunking (coming off watch and crawling into a berth someone has just left to go stand their watch) or sharing the solitude of the open sea with 800 other passengers, have we got an offer for you! Join the 30 professional crew members on this beautiful, three-masted square rigger that can reach 17 knots under sail... 29 sails, actually! Working on one of three watches, you will be actively involved with setting the sails, taking the helm and maybe even helping in the galley! Fourteen air-conditioned luxury passenger suites each have two twin bunks (plus two Pullman berths), a writing desk and a very large bathroom. After dinner, enjoy evening presentations in the Long Room, including the captain's "recap of the day and position report", murder mysteries and the camaraderie of sailors from many different countries and walks of life. Three meals a day; unlimited coffee, tea, water and fresh fruit; midmorning and afternoon breaks with snacks; and harbor/port dues are included. Additional costs are: flights, additional drinks on board, other personal expenses. "A great part of my unique experience was thanks to the crew. I wondered where they had found such friendly, enchanting, and helpful people". 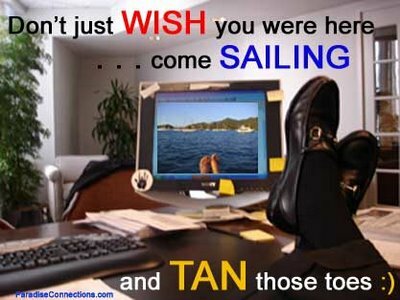 For more information, contact Paradise Connections Yacht Charters: CLICK HERE to contact us. Pick-up in Juneau. Visit the glacier in Tracy Arm (by way of Stephens Passage) to hear the sound of calving ice fields, view countless water falls and enjoy smooth water. Sail down to visit the bears on Admiralty Island, travel through Frederick Sound where the humpback whales breed, then on to Sitka to visit the historic Russian Orthodox Church and museum. There is a rain forest trail lined with totem poles. Pick-up in Petersburg. Anchor in Le Conte Bay and visit the glacier by dinghy. Travel through Frederick Sound to see the humpback whales and Stellar sea lions, maybe even killer whales. Anchor off Admiralty Island at Kootznahoo, "fortress of the bear", to view the bears. The next day, visit the small native Tlingit community, Kake and go on to Kuiu Island. The drop-off in Kake or Petersburg. Whatever the weather conditions, the spectacular scenery is easily viewed from the covered wheelhouse (which can be enclosed with roll-down plastic curtains) or snug inside through the deck saloon's large windows. Sea Angel's master suite extends the full width of the yacht and is appointed with a walkaround double berth, lady's dressing table, hanging closet and drawers built into the starboard side. To port are identical drawers and closet plus a gentleman's desk. There are 'his and hers' baths separated by a tub/shower. Additional guest accommodations for four are in two identical ensuite cabins with twin lower singles. AMNERIS - Cold snap special! Cold Snap Special - 9 days for the 7 day rate ! Baby, it's cold outside from coast to coast. Time to head to the islands. Come down, let the sun melt those tense muscles, let Captain Alex and Chef Gemma spoil you with caring attention. 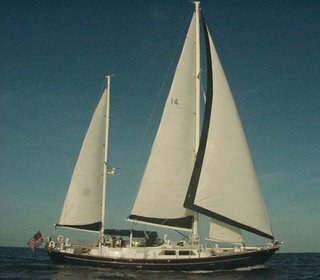 AMNERIS, a 76-foot aluminum ketch, has three en suite cabins: Aft, the full width master offers two three quarter berths, a dressing table/desk, many built-ins and two three-quarter berths with a settee between them. The master bath has a marble vanity & a stall shower with seat. There are two upper/lower single berth cabins with generous storage. The huge cockpit, with high coamings and latching gates, is secure for small children, and there is full safety netting for the lifelines. RATES: $14,900 for 2 guests, $15,900 for 4, and $16,900 for 6 guests, excludes bar/beverages. the Monaco Grand Prix and Cannes Film Festival. 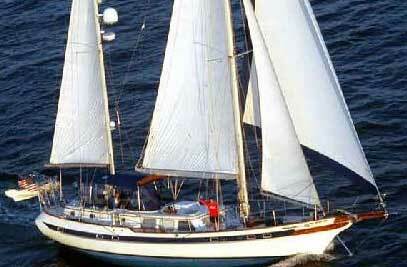 Accommodation: 10/12 guests in 5 cabins (2 doubles, 3 twins + convertible settee in the master cabin for 2 people. SECRET LIFE's Brochure: http://www.mycharter.com/Secret-Life/ contact us for this week's password. 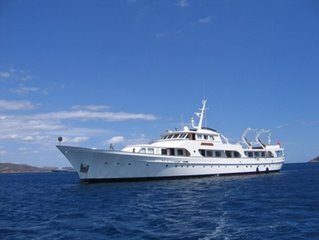 Three Moons would like to offer you a 5% discount for all new charters taking place from February 1 through June 30, 2007. This special is applicable for 7-night, 8-day (or longer) charters only. All other specials for Three Moons have been discontinued. Rendezvous diving and safari tours are still available, of course, but for an additional fee. Three Moon's also wanted to let you know that their stereo system is iPod compatible, plus they now have Sirius Satellite Radio for real listening pleasure and dancing on the deck under the stars. Randy & Shelley are having a great time working with their new crew member, Katy, and look forward to providing their clients with the best in attentive, professional service and Award-winning cuisine! Looking for something special for your anniversary, honeymoon, or birthday? 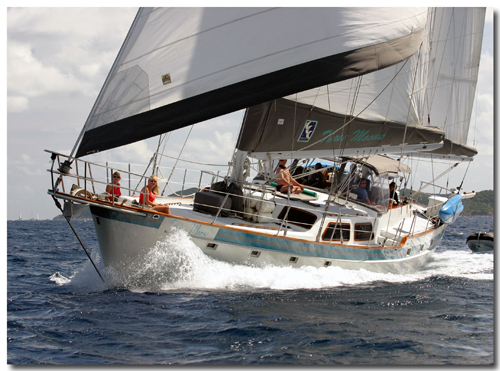 Come celebrate aboard SUDIKI in the Grenadines! 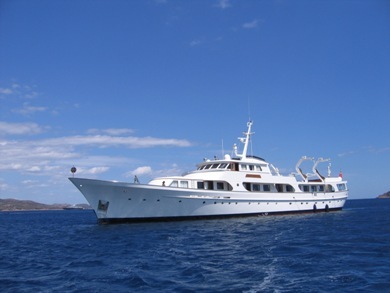 SUDIKI, a Gulfstar 60, is offering EIGHT nights for the price of SEVEN! This all inclusive rate, includes standard ship's bar, beverages and cruising taxes, along with a special "Welcome aboard" champagne, and your choice of an island tour or a rendez-vous dive. Sudiki accommodates up to 4 guests and you can choose any two of Sudiki's three cabins, each of which has ensuite head/shower. Explore the Grenadines with people who know every nook and cranny. 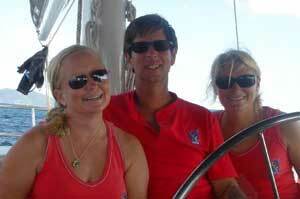 Duff and Chris Walter have made their home in these beautiful islands for over 15 years. Whatever your dream vacation may be, lively or laid back, they will take you to the perfect beaches, night spots and local markets.